Notice: Undefined offset: 1 in dwell_imagefield_insert_tags() (line 388 of /var/www/html/dwell/drupal/sites/all/modules/custom/dwell_imagefield/dwell_imagefield.module). Spin art isn’t something people normally engage in on a trade show floor—perhaps the state of the housing and building market is just too depressing to play with paint at present. Whatever the reason, I was pleasantly surprised to stumble upon Greenbuild show, which kicked off yesterday in Boston. YOLO’s green credentials are impressive—even in the context of a green building show. All of their paint is zero VOC (VOCs are the solvents in paint that contribute to poor air quality and to the depletion of the ozone layer) and green-seal certified. 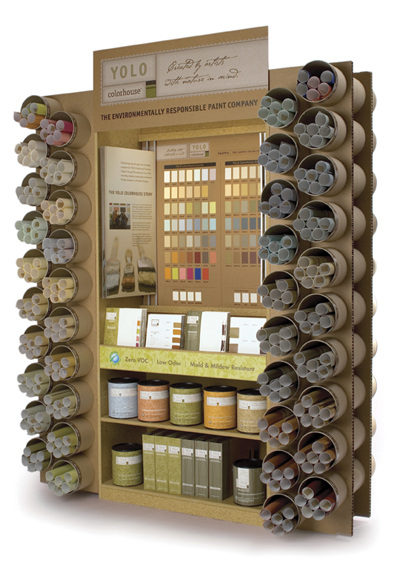 But beyond the actual product, the company very evidently embraces sustainable living: They pioneered the use of repositionable poster swatches instead of test paint, cutting down on wasted paint that creates disposal problems. YOLO’s artists designed the paint collection specifically for architecture, so the entire palette works together on a large or a small scale. To keep the process simple for consumers, they’ve adopted the less-is-more mantra, limiting their color palette to a small selection of well-curated colors. The Sprout Collection is their latest endeavor and while it’s perfect for the kiddies, it also makes a pretty fantastic medium for spin art, should the housing market pick up anytime soon.